Sisters Theresa Wheeler and Deanne Doi are trying to help people find housing with the "Hope Street Project." Deanne Doi lives with her sister, Theresa Wheeler, in a modest home near the end of their road in Chewelah, about an hour north of Spokane. Doi stands on a small deck on a recent morning, sipping coffee from a mug that she makes sure to point out says, "Sisters are like fat thighs ... they stick together." "My sense of humor gets me in a lot of doors," she says, laughing. 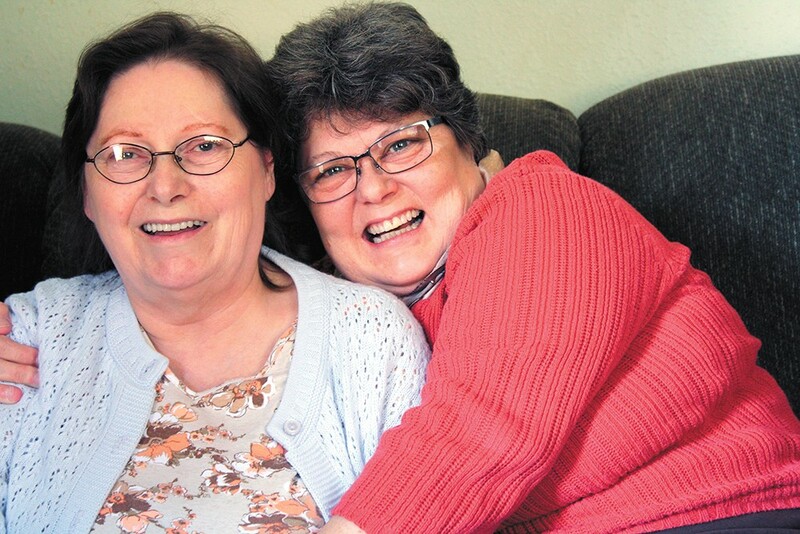 Doi has been homeless before, and if it weren't for her sister, she'd be homeless now. Doi is almost three decades sober after she says that God saved her from cocaine and alcohol addiction during a medical detox. She spends time talking with people who are homeless, pointing them in the direction of services and letting them know someone loves them. "That's why we do what we do, we understand," Doi says. "I've always told our family we may not have a lot of money, but we have a lot of love, and we learn how to share it with those that don't have." Doi and Wheeler are part of a group of passionate volunteers who for more than a year have been meeting to figure out how to house people who may fall between gaps in local services. They call themselves the "Hope Street Project," and have been able to take donations under the umbrella of the charity Tri-County Community Health Fund. Most of the people in the group know well that homelessness isn't always as visible as someone sleeping in an alcove or on a park bench: While the group works to start a centralized homeless center, several of its members have put their money where their mouth is and let people sleep on their own couches or property. Even with eight people already living in their home, the sisters made room for a man struggling with mental illness this winter. He was sent their way by another woman working with Hope Street because she had no more space. "Nobody wants those folks, and those folks are us, they're our children, they're our nieces and nephews," Doi says. While their plan is ambitious, Hope Street's largest hurdle will likely be finding money to pay for their plan to end homelessness. They've understandably faced skepticism from some Stevens County leaders, who want to be sure there's really a need above what the county already helps provide, and who have a duty to spend taxpayer money responsibly. 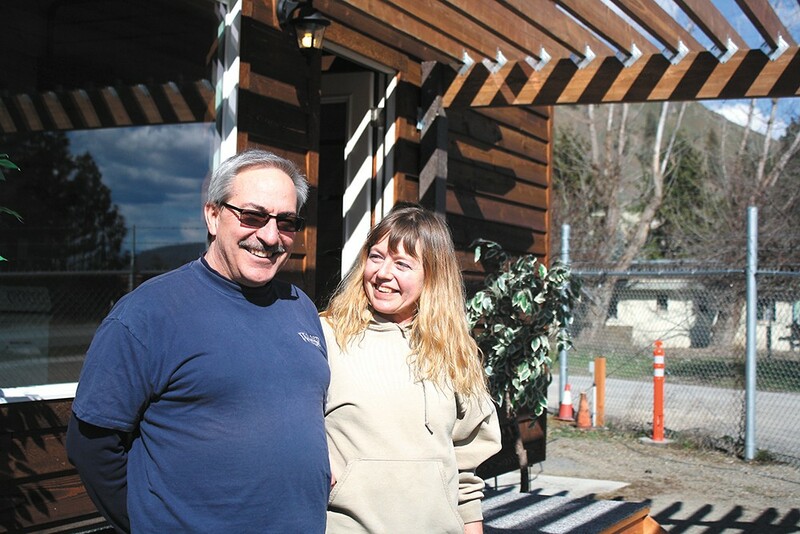 Keith and Daisy Wilder, of Wilder Construction, in front of the first tiny home built for Hope Street. As others in the region huddled around their TVs to watch the Zags tip off in the NCAA championship game, more than a dozen Hope Street volunteers met in the waiting room of a Colville health clinic after business hours to talk about homelessness. Among their ranks: church leaders, a doctor, trained mental health volunteers, and untrained volunteers who have helped house the needy or been there themselves. Barry Bacon, a key leader in the group, opens the meeting with updates on what's happened since they met in early March. Their first priority is to open a center in Colville where people can bathe, do laundry, have a locker, get peer counseling for addiction and mental health, see a doctor, train for jobs and get other services, in addition to having a place to sleep. A key part of the Hope Street plan is to make the center sustainable, maybe through renting out retail space on the ground floor of whichever building they wind up in, and they're keeping an eye on the Legislature, hoping to keep homeless housing and assistance money available. "I don't want to create another drain on our community," Bacon says in an interview. "We're already strained up here in northeast Washington." With less than 5,000 residents counted in the most recent U.S. Census, Colville is the largest city in Stevens County, and as county seat, is home to most of the available services. The city has a warming center that can house people temporarily, but only when it gets too cold; a men's shelter has space for maybe seven people; and women have few options if they are trying to stay sober, escape domestic violence or need a place to stay. Each volunteer in the room knows from personal experience that while there are services, there are gaps. Leta Phillips, executive director of the nonprofit Community Partnerships for Mental Health, says she's seen her mother, sister and daughter struggle with schizophrenia, and knows that certified peer counselors can help connect with people who distrust service providers, reduce stigmas around mental health and educate the public. "Every one of us has a disorder or a family member with a disorder," Phillips says of the peer counselors, who hope to assist in the new center. Hope Street plans to add to what's already there and provide more access for people who might not meet the criteria of other area shelters. They might try to buy and refurbish a building or go into one that hasn't yet been built, and Catholic Charities has expressed an interest in relocating their local office to the new site, Bacon says. The group received verbal support from the Colville City Council mid-month to ask Stevens County commissioners for money to open the center. But the city also asked to see letters of support from the area's main service providers, Rural Resources and NorthEast Washington Alliance Counseling Services, because no one wants to rob Peter to pay Paul. Rural Resources plans to meet with Hope Street in coming days to talk about where they might partner up and leverage resources together, says Greg Knight, executive director. "We could be a good partner with them," Knight says. "If what they're proposing is what I think it is, it'd be awesome." Stevens County Commissioner Wes McCart says he wants to know that any proposal from Hope Street wouldn't be duplicating services. He's also concerned about "putting all of our eggs in one basket" by adding more service in Colville as opposed to elsewhere in the county. For starters, McCart says he wants to get a good idea of how many people aren't already served by programs. "We have our point-in-time count, which I will admit is probably not a very good indicator of what the homelessness situation is, but it is extremely low," McCart says. In 2016, the count was 32 people countywide. But Bacon, a leader of Hope Street, points to another indicator — the number of students registered as homeless with their schools. In Colville alone, there were 68 during the 2015-16 school year, and closer to 375 countywide for that year, according to data provided to the state Office of the Superintendent of Public Instruction. "That's the tip of the iceberg," Bacon says. "Often you don't want to be known if you're homeless, especially with kids. Most are couch-surfers, not living in a car or on the streets." For their part, Bacon and his wife, Shelley, are housing three families in need on their property — a family with a teenage son is staying in a hostel they sometimes rent out, a woman and her adult disabled son are living in a camper, and a man and his young son are living in the home. "The nature of working on homelessness, it's a messy job, messy business. That's the nature of human beings," Bacon says. "We know that just tucking them away in places on our property is not enough." The tiny home sleep three. So Hope Street Project is also working to build tiny homes for people who may want to buy a place of their own, but can't afford it without someone working alongside them. The first home was finished in March by Wilder Construction for the family of three living with the Bacons. 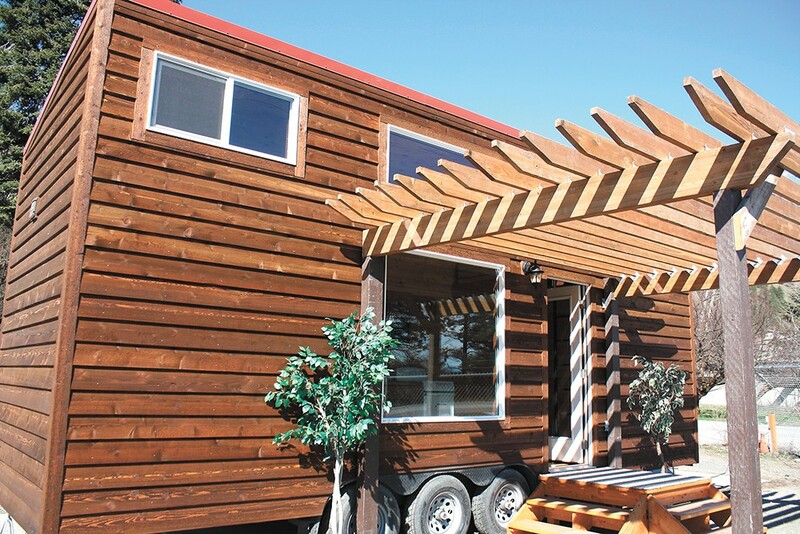 At just under 14 feet tall, the wooden home on wheels can travel down the road behind a pickup truck, and only needs standard RV hookups to water and electricity to get up and running. The family will pay off about $25,000 of the cost in small installments. "Let's face it, everybody knows someone that's not doing well," Wilder Construction owner Keith Wilder says. "Realistically I'm only two bad jobs away from being that guy. It could happen to any of us." Hope Street wants to build two other tiny homes by the end of the year, but they're running into setbacks. They hoped the first home would come in around $25,000, but even with much of the labor and materials donated, it's closer to $35,000, and if it were to be sold at retail, would hit more than $50,000, Wilder says. They also need to find somewhere to keep it so the family can live in it. As they deal with those issues and state certification (they found out they need to put in a second exit, which will add to the cost), the group's best selling point for the homes and central homeless shelter they hope to build in Colville are that all those services can save money. Through a "housing-first" model, the group expects to save the community thousands on medical, jail and legal costs for every person who gets shelter. The general idea of "housing first" is that when someone doesn't have to worry about where to sleep or eat, they can start to work on the other underlying issues that got them where they are, and they're less likely to need to go to the ER or wind up in jail, racking up bills other people wind up paying. Asked about the housing-first model, McCart was skeptical. "You're asking me as a government entity to provide housing first with no conditions. I have a real hard time spending other people's money for that cost," he says. "Housing first" encompasses a variety of shelter and housing options, and is accepted and promoted as successful by local and federal agencies that address homelessness. Nearby, it has been embraced in Spokane. McCart says that as far as he knows, the county has "not had a proposal for a homelessness project that we have turned down." "And that's not to say we won't, but you know we do have a hands-up, not hand-out, philosophy," McCart says. Depending on how the county responds, Bacon says he'd like to get some part of the central homeless shelter up and running this summer, at the very latest before the weather gets cold again.